Although large in the Empidonax genus, the Alder Flycatcher is a small species within the flycatcher family. Thirteen to seventeen centimeters in length, with a wingspan of approximately 21 cm, the Alder Flycatcher has dull greenish-olive upperparts with a similarly colored, but darker, crown. The eye-ring is narrow, whitish, and sometimes indistinct but rarely lacking, while the throat is clearly white and contrasts with a gray breast band. The bill is black on the upper mandible and dull yellow-orange or pinkish on the lower. The wings are darker than the back, have white-edged tertials (innermost secondaries) and wing-bars that are whitish and boldly marked (Lowther 1999). The vocalization of the Alder Flycatcher is a harsh and burry, three syllable "rreeBEEa" or "fee-BEE-o" (Lowther 1999, Sibley 2000). For a more complete description, see below on distinguishing between the vocalizations of the Alder and Willow (E. trailii) flycatchers. 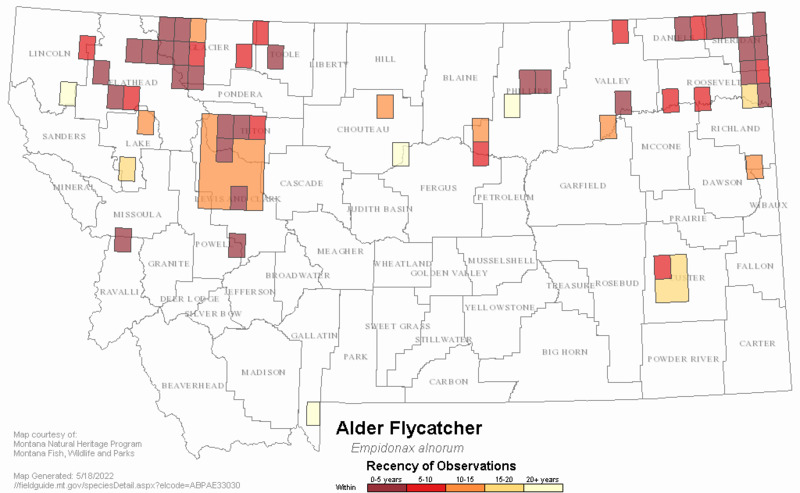 Other flycatchers found in Montana with which the Alder may be confused are the Least (E. minimus) and Willow Flycatchers. 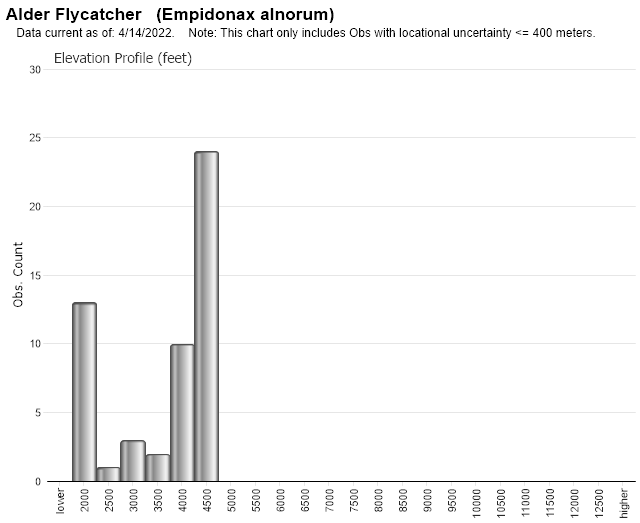 In comparison, the Least Flycatcher has a shorter, narrower bill, a bold, complete eye-ring, thinner tail, and different song (Lowther 1999, Sibley 2000). The general appearance of the Alder Flycatcher is so similar to that of the Willow Flycatcher that separating these two species visually can be extremely difficult (Lowther 1999). The Alder Flycatcher is best separated from the Willow Flycatcher by voice. The song of the Alder Flycatcher (a 3-syllable "fee-BEE-o") is described as being harsh and burry in nature with a strongly accented second syllable, making it sound like a 2 syllable "rrree- BEEP" (Lowther 1999). The song of the Willow Flycatcher is accented on the first syllable, more of a "FITZ-bew," but may occasionally sound as though it has a subtle third syllable, "FRITZ-be-yew" (Lowther 1999). The call of the Alder is described more as an emphatic "pip" or "pit" (reminiscent of an Olive-sided Flycatcher) in contrast to the liquid "whit" of the Willow (Gorski 1969a, 1971, Lowther 1999, Sibley 2000). Lowther (1999) indicates that, generally, the Alder has a darker overall appearance, "slightly greener crown, more pointed wings, slightly shorter bill, and slightly longer tail." Observations in May indicate the earliest presence of the species in the state. 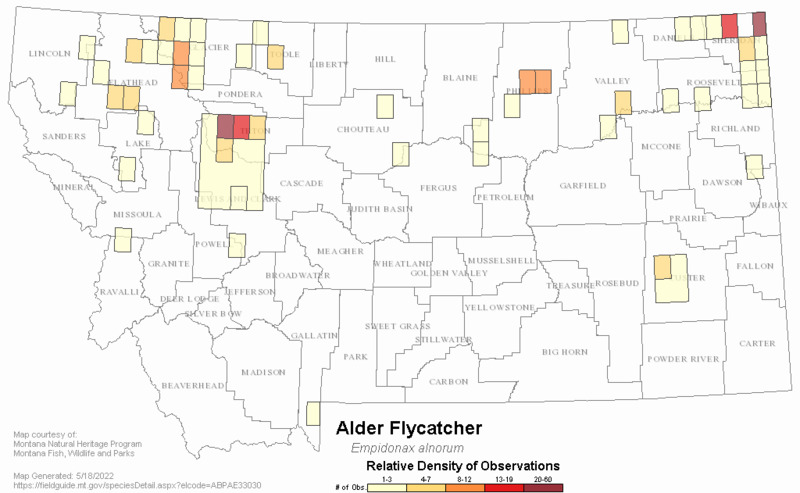 Alder Flycatcher records continue generally only through July, with one rarity; an individual at Pine Butte that was observed in September of 1991 (Montana Bird Distribution Committee 2012). Habitat use is similar to that of the Willow Flycatcher and includes willow (Salix) thickets, red osier dogwood (Cornus sericea), or birch (Betula sp.) along the edges of wetlands, streams, lakes, and forests (Johnsgard 1992). The Alder Flycatcher's diet is comprised mainly of insects obtained primarily by flycatching (Bent 1942), although gleaning prey from tree and shrub foliage is also a known foraging behavior (Lowther 1999). Berries supplement their winter diet (Stiles and Skutch 2003). In areas where breeding ranges overlap, Alder Flycatchers show less aggression toward Willow Flycatchers near nesting sites than any other species; Willow Flycatcher are the more dominant of the two species (Gorski 1969b). 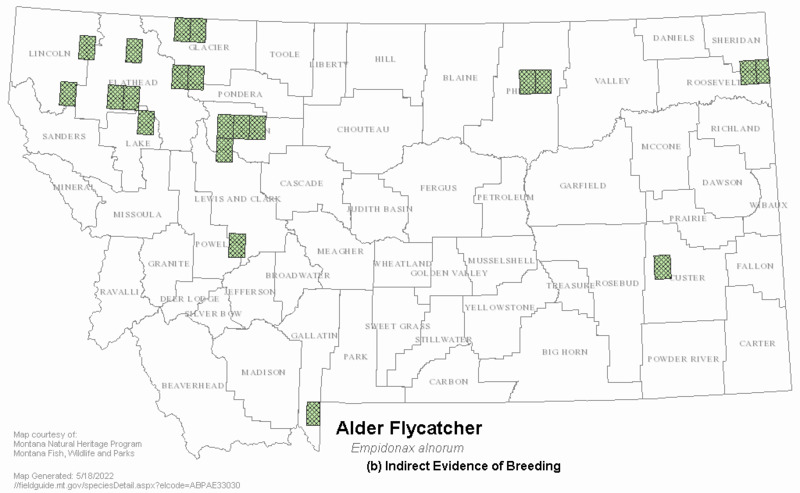 No direct evidence to support breeding in the state has been documented, although the species is suspected of breeding at Pine Butte Preserve, Teton County (Montana Bird Distribution Committee 2012). 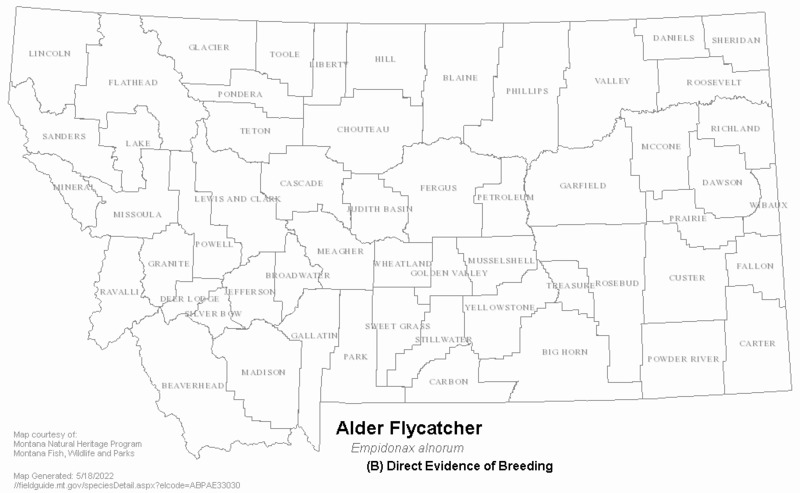 Other locations where the species has exhibited behavior to suggest breeding include Smith Lake (Flathead County), Cougar Creek (Gallatin County), and Fisher River (Lincoln County). In areas where this species breeds, the nest is described as somewhat bulky and loosely constructed of soft dead grasses, leaves and other plant fibers, moss, and bark, sometimes with feathers, and lined with finer grasses, plant fibers, and hair (Baicich and Harrison 2005, Lowther 1999). It may also have an untidy appearance, with hanging tails or streamers (Baicich and Harrison 2005). Nests are located in damp thickets of alder and various shrubs, in bogs, along marshy borders of lakes, and in brush along stream banks, and are usually placed less than 2 meters above ground (Harrison 1979). The average clutch size of subelliptical to short-elliptical eggs is 3 to 4, sometimes 2. The eggs are 18x13 mm in size and are smooth, non-glossy, white or creamy-white, possibly tinted buff or pink, and unmarked or lightly marked with light red, or reddish-brown, primarily on the larger end (Baicich and Harrison 2005). Incubation, by the female, lasts 13 to 15 days, and the young, tended by both parents, fledge at 12 to 15 days. 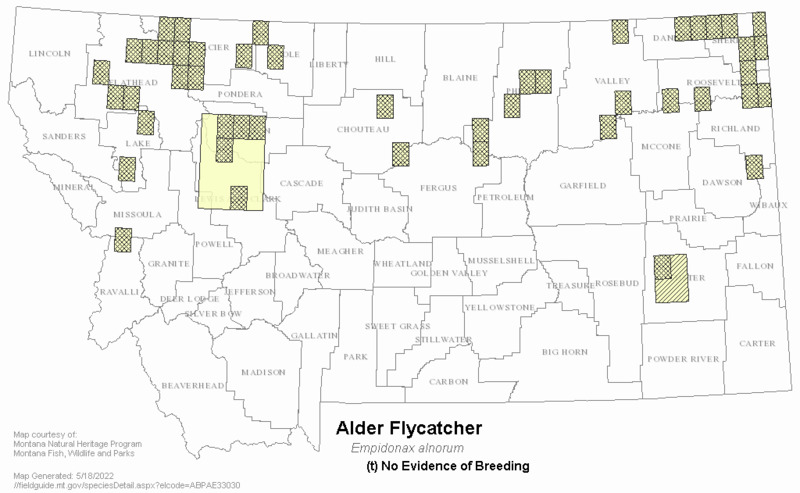 No information is available on management activities in Montana specific to Alder Flycatcher, although the suspected breeding location for this species is protected within Pine Butte Preserve. Gorski, L. G. 1969. Systematics and ecology of sibling species of Traill's flycatcher. Ph. D. dissertation, University of Connecticut, Storrs, Connecticut. 81 pp. Gorski, L. J. 1969. Traill's flycatcher of the "fitz-bew" songform wintering in Panama. Auk 86:745-747. Gorski, L.G. 1971. Traill's flycatchers of the "fee-bee-o" songform wintering in Peru. Auk 88:429-431. Harrison, H.H. 1979. A field guide to western birds nests. Houghton Mifflin Company, Boston, MA. 279 pp. Web Search Engines for Articles on "Alder Flycatcher"